With each holiday, I was buying up the veggies to make a veggie tray in the shape of a Thanksgiving Turkey, or a Christmas Tree, or one bringing in the New Year. No holiday is too small and no veggie tray is too big! And honestly, they never included just veggies. You always have to have some cheese and who knows, maybe even some fruit! They’ll make you feel so creative because you can customize and shape them into anything you want! These are the veggies I used but feel free to put your own spin on things and substitute in what you like! Also, you wouldn’t have to use the same amount of each ingredient. Load it up! 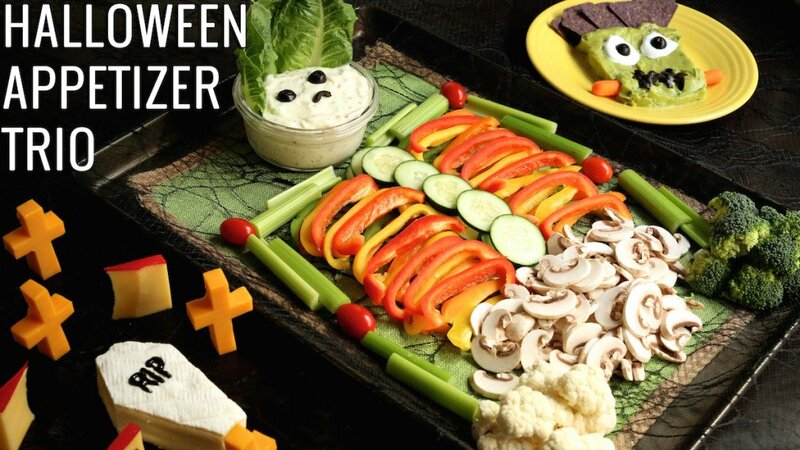 Ladies and gentleman, I introduce you to my newest and largest veggie tray creation to date…. Place the container of veggie dip at the top of your dish/platter. 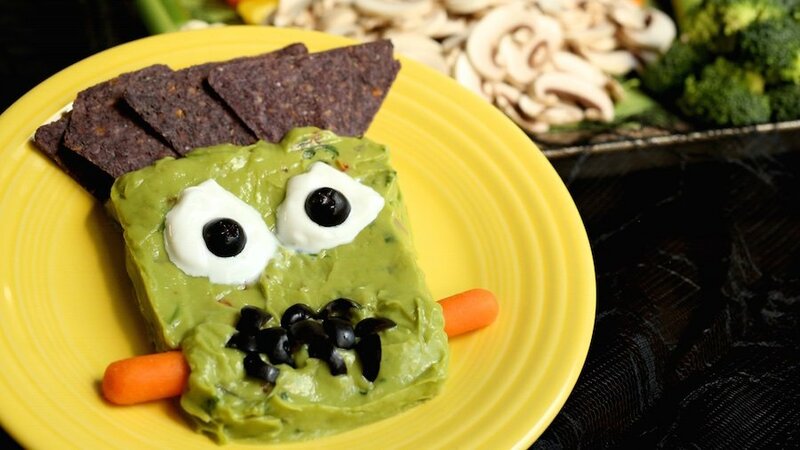 Insert a few pieces of Romaine Lettuce leaves as hair and olives as the eyes and nose. Place the slices of cucumber in rows on top of each other as the spine. For the ribs, cut all four colors of the peppers in slices from top to bottom and stack on top of one another on either side of the cucumber spine. Place the sliced mushrooms under the ribs as the pelvis. Lay out the celery as shoulders and arms, connecting both with a cherry tomato as the joint. The broccoli and cauliflower are the hands. Cut the brie wedge into the shape of a coffin by cutting of the top, part of the sides, and bottom point. Cut the Gouda into squares/rectangles like headstones and leave the red wax on top. Cut the Cheddar cheese block in half long ways, and then in shapes of crosses. Use the black gel icing to write RIP on the brie and headstones if you wish! Place the guacamole on a plate and shape into a rectangle. Use a dollop of sour cream for each eye and place an olive on top of each dollop. Cut some olive slices in half and insert haphazardly as the mouth. Take two baby carrots and insert into the sides of the ‘head’. Gently press blue tortilla chips into the top of the ‘head’. 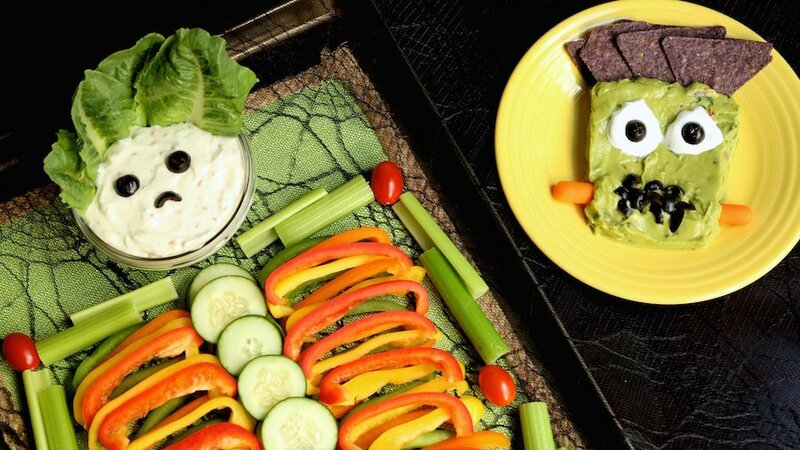 You know I’m a BIG fan of your veggie trays ever since the Turkey last year! I believe this one is my very favorite though! Just visiting yours and Jessica’s site today to get a party idea for a get-together next week and I think I found it!!! 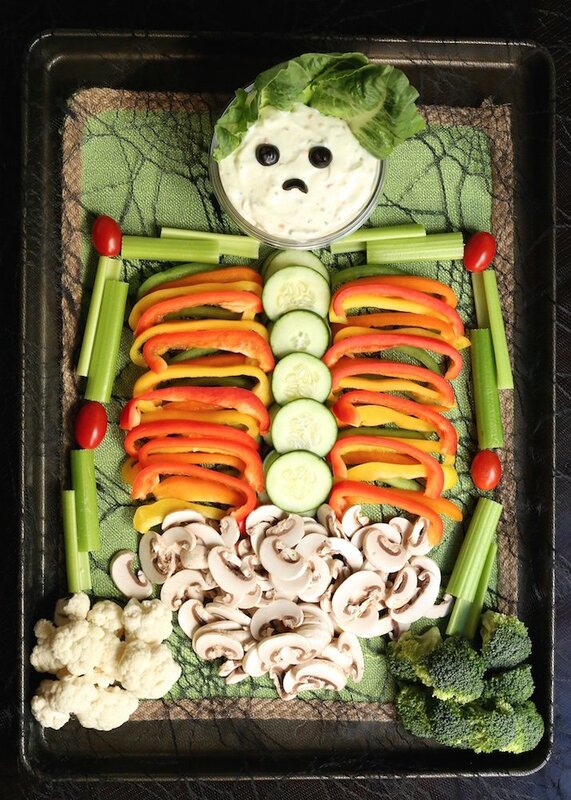 How did u create the spider web effect under your veggie skeleton? ?